A luminary of the vibrant Waiheke Island photographic scene, Emma Hughes has established a career as one of the country's leading wedding photographers. For this year's Auckland Festival of Photography, however, she is taking a step away from marital bliss and into the ring of competitive fighting. For the new exhibition, Fight, she turns her lens onto the fledgling warriors about to embark on their very first public bouts. She talks to D-Photo's Point-Shoot blog about the endeavour. D-Photo: Can give us a brief description of your Fight exhibition? Emma Hughes: Fight is a collection of studio portraits of eleven fighters who are about to step into the ring for their first public bout. It also has an audio component to it with short interviews from the fighters and a wonderful poem by acclaimed spoken word poet Selina Tusitala Marsh. Going from weddings to fighting is (one would hope) a change of pace – what attracted you to boxers as a subject? A bit of a change from wedding photography, yes I agree! 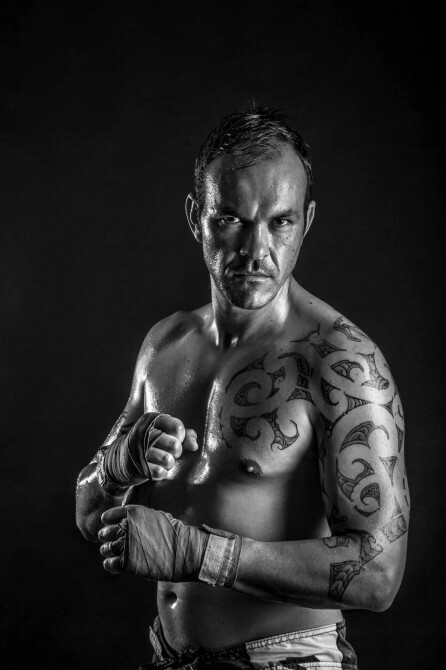 Studio portraiture has always been a passion of mine however, and I have been involved in kick-boxing for more than six years (it’s one of my other passions), so it was a natural and easy fit for me. This crew of fighters attracted me because, up until a few months ago, they had by and large been training as a form of personal fitness and fun, but were given the opportunity to step into the ring as part of a fundraiser for local schools. I am interested in what made them want to do it and how they feel about it (this is what the audio interviews cover). You've said the series turned out differently to how you initially imagined, how and why is that? Yes, when I first began thinking about the exhibition I imagined employing the use of long exposures and movement to capture the sense of the ‘double life’ that these fighters have (their day jobs include chef, real estate manager, interior designer, etc.). When it came down to the actual shooting I ended up only having around 20 minutes with each of them in front of the camera, and during this short period of time I had to capture all the images required to promote the fight night as well as what I wanted to achieve for the exhibition. I was able to work with the concepts of motion briefly with a couple of the fighters, but there just wasn’t time to explore it fully, so instead I concentrated on more traditional methods, working with narrow lighting to create dramatic portraits. When it came time to curate the show, I chose to keep it focused on the more traditional portraits in the interests of creating a visually cohesive exhibition for the walls. Was being in front of the camera difficult for the fighters? A couple of them were really nervous. It definitely took them right out of their comfort zone (especially as I made them coat themselves in body oil and then sprayed them with water, which was a bit of a laugh), but they all seemed to enjoy the process. What sort of lighting and equipment did you use for the shoots? I used a variety of lighting scenarios depending on what I was trying to achieve. With some I employed only a single light source and others had four studio lights highlighting different parts of their bodies. I use Canon camera and lenses and a mix of Multiblitz and Photoflex studio lights. What was the biggest challenge you faced in putting the series together? The tight timeframe was the most challenging component, and trying to capture a wide enough variety of shots to make the exhibition interesting for the viewer. You've exhibited in the festival before, have you learnt any lessons from past experiences that will influence this exhibition? My last experience was so positive and well received that I’ve chosen to incorporate some of the same elements again this year – in particular I learnt that the use of audio clips really adds a lot to the viewers' experience and connection with the work in front of them. What other exhibition are you looking forward to seeing at this year's festival? I always find Christine Webster's work thought-provoking and confronting, so I’m looking forward to seeing that, and also It’s Personal at White Studios. Other ones on my hit list are Analogue Explorations, Memento Mori and Beyond Dust... plus many more. It’s a long list!